This week we celebrate Earth Day, a day when we show our support for environmental protection through events and simple sustainable acts to help our environment. This year Little Lady and I are hard at work on a container garden that will give us fresh fruit, vegetables, and herbs this summer. 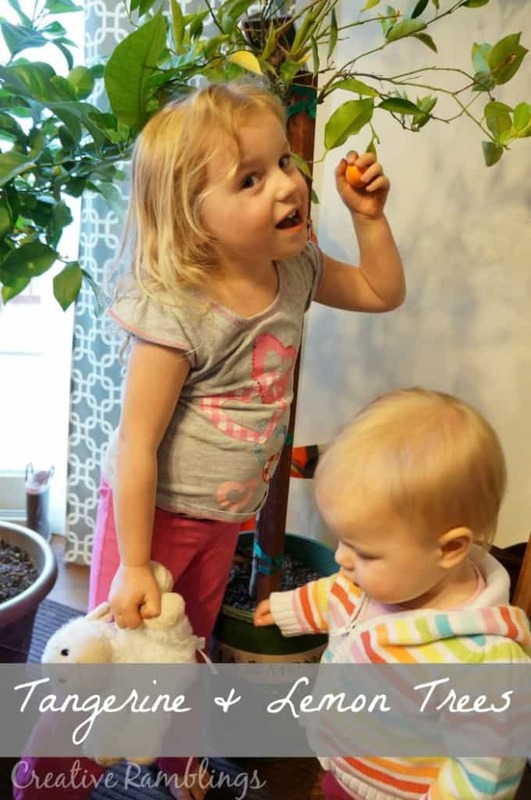 I want to share with you our progress along with some tips on gardening with kids. 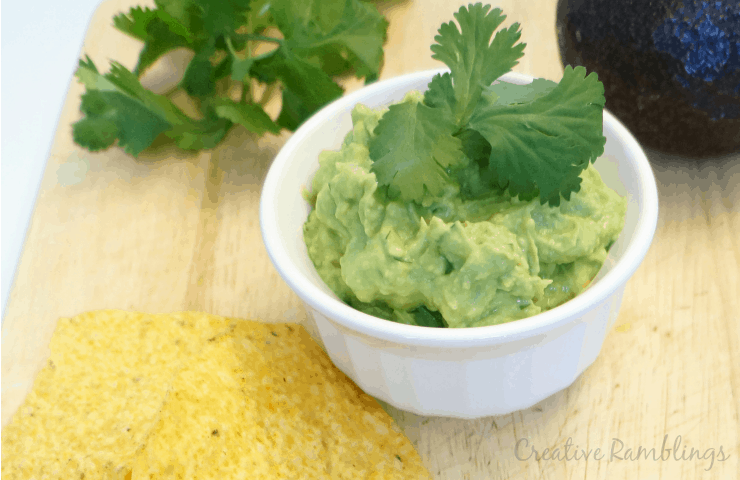 I’m also sharing my absolute favorite, and easy, fresh guacamole recipe with you. By the end of the summer I should be able to use ingredients from my garden to create this delicious dish. My family and I strive to live a simple life, which goes hand in hand with living green. The more we can take on ourselves, the less we rely on outside services. We spend less and create less waste while enjoying the fruits of our own labor. This year we decided to start gardening, for real. We’ve done a few pots of tomatoes in the past but nothing substantial. Our soil is not the greatest so we decided to do small containers on our deck and grow our favorite and most used fruits and vegetables. Start small. Kids respond well to a small project they can wrap their heads around and see through from start to finish. Let them get their hands dirty and get involved in every aspect of gardening. Picking out seeds and pots, planting, and regular watering. Plant a variety of fruits and vegetables. It’s amazing what a child will eat if she has a hand in growing and harvesting it. Notice the painted plastic chair and pot still in awesome condition from last year! It’s mid April in Wisconsin so our garden is just getting started. Until my herbs and vegetables come in I need to rely on my local grocery store for these foods. I am not growing enough to sustain my family completely, far from it, this is a hobby garden that will produce side dishes for a couple of meals each week. I rely on Pick ‘n Save for most of my fresh produce and other groceries. One of my favorite snacks year round, but especially in warmer months, is guacamole. There is nothing quite like fresh made guac! When shopping for the ingredients it’s helpful to know what I am buying. 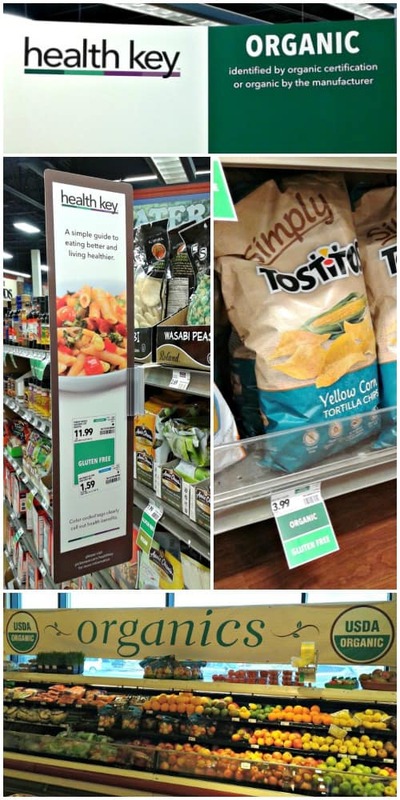 Pick ‘n Save uses the health key™ system, a series of tags underneath products, that give shoppers a simple guide to eating better and living healthier. This system directs shoppers to Vegan, Gluten Free, and Organic products throughout the store. It’s so easy to pick my favorite Organic chips out of the aisle. 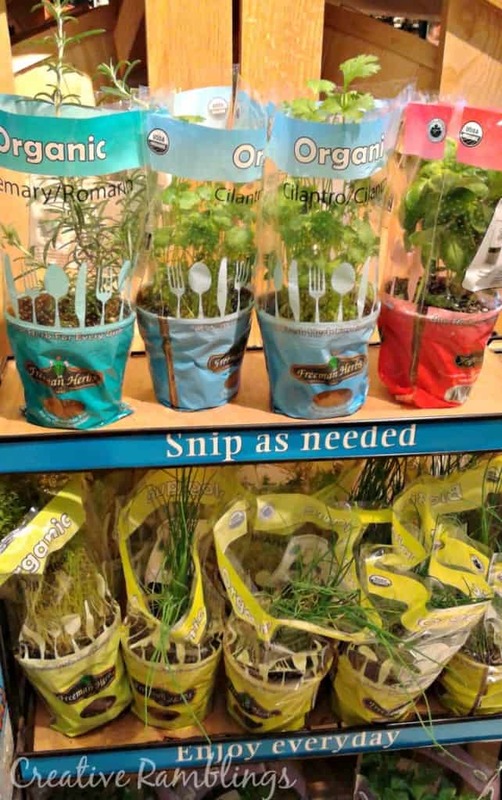 My Pick ‘n Save also offers an organic produce section. I choose to buy organic when I can. I like to know not only what goes into the food my family eats, but also how it’s grown. I feel good knowing I am feeding my family organically grown products free from nasty pesticides and other chemicals. This month I was able to get some great deals on my ingredients during the Think Spring Sale, head over to Pick ‘n Save’s website for more details. My simple fresh guacamole is just a couple of ingredients and can be tailored to your taste. Finely chop the garlic on a cutting board then cover it with salt. Let sit for a few minutes then mash with the back of a spoon. 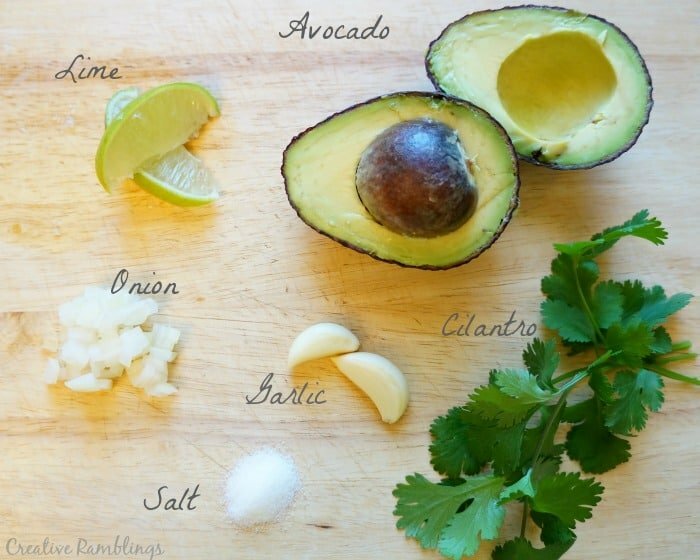 Mix avocados, garlic, onion and lime juice to your desired consistency. Add chopped cilantro and stir, topping with a few sprigs of cilantro. Hungry? Be sure to pin this for later so you can make your own batch! While at Pick ‘n Save I picked up a Cilantro plant in the Organic produce section. This is the one plant that will live on our kitchen counter. I am already enjoying picking a leaf here and there for cooking. I am looking forward to using this along with onions from our garden later this year to make our favorite guacamole. Do you have a garden? Tell me about your favorite fresh recipe. Be sure to follow Pick n Save for great deals and inspiring recipes. You can find them on Facebook Twitter and Pinterest. I wish we had a Pick n Save where we live. This is great everything is at your fingertips! This dip looks delish! I just had tostitos with my lunch, this guacamole would of been great to have for dipping! Definitely pinning, thank you. This is making me hungry- I LOVE guacamole! Being from the East Coast, I never paid much attention to avocados but when I first started dating my husband (who is from Southern California) he took me on a trip out West and his friends introduced me to the concept of avocado on burgers, and even better, guacamole on burgers. Needless to say, I was hooked. Thanks for sharing- I’m definitely pinning this! Looks so good! I would love to grow my own fruit and vegetables, but I just don’t have a green thumb. Neither do I Tonya, I have started slowly and am finally confident enough to grow some “real” food. It’s so worth it. Thanks for stopping by today. I so agree, thanks Kaitie. Sounds yummy! I love Guacamole, so I’ll be trying this out. I’m also in WI, so I shop Pick ‘N Save too…especially on Wed. and Sat. for double coupons. Wednesday and Saturday are my choice days too! Enjoy your guacamole and thanks for reading. 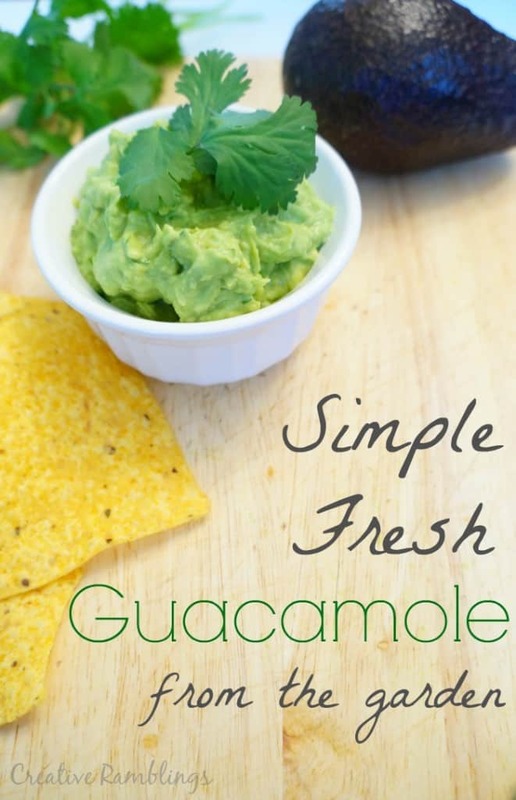 I really love this – fresh is always best and I do love some fresh guacamole as well. Shelley, that’s exactly what I am looking forward to with my daughter this year. She loves to be involved and this is such a great experience for her. So glad you like the recipe, enjoy and thanks for pinning. Your Guacamole looks wonderful! I love fresh homemade Guacamole. I can’t wait until our garden produces so I can start having fresh vegetables. I tried planting an Avocado Tree last year but unfortunately it died!! What store is that where you took pictures? I would love an avocado tree but I have heard they can be tough to grow. Until then I will shop at Pick n Save, it’s a Wisconsin/Midwest store. They always have amazing produce. discovered a way to keep leftover dip fresh and not turning on ya …. cover with about a half inch of water, put lid on container and refrigerate ….. did it yesterday and had for lunch today ….. dumped water off and nice and fresh and green still !!!! Rita I had never heard of that, awesome tip! Thanks. Our family LOVES guacamole! No joke, I think if my hubby could only eat one food item for the remainder of his life, it would be chips and guac! So, needless to say, I have to try your recipe 🙂 Also wish we had that cool key program on the shelf labels at our grocery stores….very cool idea! Thanks for sharing! I could live on that too, so good! Thanks Mel. I hope you get to have some kind of garden at your new home, even a container garden can produce so much goodness.